If you had to get one, how would you know which one you'd like more? Well I did order the 88 Shimmer Palette off ebay when I purchased my 120. And it took a little longer to arrive. But now, it's time for an initial comparison of both popular palettes! 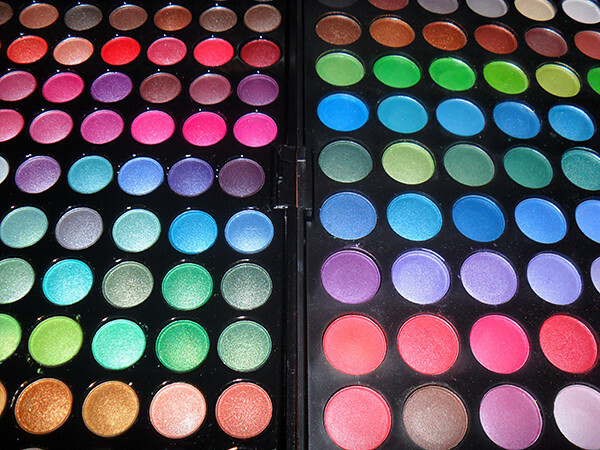 Size of Case: Similar palette dimensions, but the 88 palette has all its eyeshadows on 1 side, whereas the 120 has 2 separate palettes within, so it's thicker and heavier. Case quality: 120 wins. My 88 neutral arrived with the latch broken off, and the 88 shimmer is hard to open. They are also thinner and less sturdy than the 120. The only con for the 120 is that each of the 2 palettes are detached from the main case itself. Some people may like being able to bring the palettes out and about, but I find it too prone to eyeshadow incidents, so I actually glued my 2 palettes to the case. Eyeshadow Volume: 120 wins. Besides the fact that there are 32 more pans, each pan is also at least 150% the size/volume of an 88 pan. As circles go, it's probably close to double the amount of shadow. Odds are, the 120 will last you a good while longer than the 88. Color spectrum: I have to say the 88 wins, color-wise, and the 120 wins texture-wise. Despite having less colors, there are no repeats in the 88 shimmer palette. You have all the reds, pinks, browns, blues, greens, yellow, deeps, and highlights you need. The 120 has a some duplicates (or colors close enough to be so). It does offer a variety of matte and shimmer, which is great, but the fatal flaw is it's lack of soft nudes and really rich, deep tones (coffee, navy, indigo) for contouring and definition. 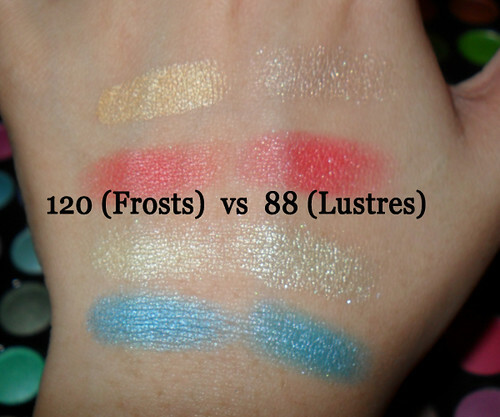 Texture/Pay-off: 88 Shimmer vs 120's non-matte Shades are like MAC's Lustre shadows vs Frosts. Frosts tend to be more opaque, with a satin-y finish. Lustres tend to be a little more translucent, but also more reflective and shimmery. It depends which sort of finish you like. Pay-off wise, the 88 is far more consistent than the 120 though. If that's important for you, get the 88. Usable Wet? Yup for both! But I find the 88 Palette works better with water or mixing medium than the 120. Pretty much the whole palette can be converted to wicked chrome-finish liners because of the intensity of these shades when wet. Below, I picked 2 almost-identical teals, but as you can see, the level of sheen differs greatly. 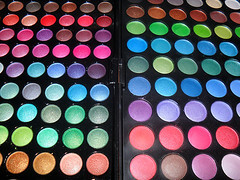 Only a very small handful of colors in the 120 palette can give you that level of sheen. Longevity: Both of these wear well with a primer beneath, and I'm not about to go out and about without any on, so I am not a good judge on this. Blendability: The 88 Shimmer palette is easier to work with as far as blending different shades goes. HOWEVER, unless you're going to use everything wet, you will get a stronger contrast with the more opaque colors in the 120 palette. It takes a little more work, but you will get a more dramatic effect without having to wet any except the hardest of the matte shades. 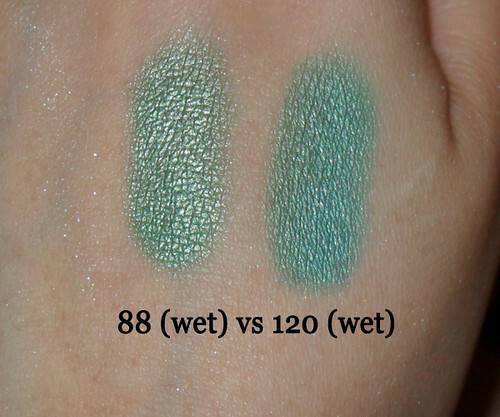 Verdict: If you are looking for the option to spice up your existing collection of shadows without forking out a ton of money on dramatic colors, get the 88 Shimmer. If you're just starting out and need something that will be the centerpiece and mainstay of your budding eyeshadow collection, get the 120.